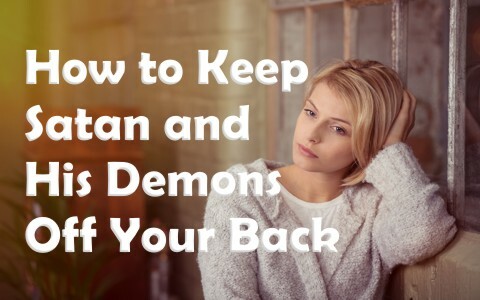 What can believers do to keep Satan and his demons off their back? To begin with, I doubt very much I’ve been personally attacked by Satan. Since Satan is a created being, he can only be in one place at a time, so I believe most, if not all, of the spiritual attacks I get are from the demons. Satan’s got bigger fish to fry than me so he’s probably focused on world leaders or powerful political figures. Satan and his demons are created and can’t be in two places at the same time like God can. God is spirit and is not limited by time or space, and even though the Devil and his minions are spirit, they’re created beings and so they cannot be omnipresent, or present everywhere at the same time, but if you want Satan or his demons off your back, here’s what you do; nothing! I mean don’t witness, don’t pray, don’t read your Bible, don’t assemble with the saints, don’t overcome sin, don’t visit the sick, those in prison, or make strangers feel welcome. These are things that the Bible commands but if we don’t do any of these, we’re no threat to Satan’s dominion of darkness, so he, or really, his demons won’t waste their time on someone like that. I believe that the single greatest thing we can do to keep spiritual attacks at their minimum is to pray. I don’t think Satan or his demons fear anything more than prayer, even though reading and studying the Word of God is close. If we are in prayer frequently during the day and praying for protection against the Evil One, we’re in a better position to put out the fiery darts of the Enemy (Eph 6:11-12). Whenever you find it hardest to pray is precisely the time you need to pray the most. It could be influences from demonic attacks that make you have no interest in praying, but in a similar way, when children are at their most “unloving” or difficult periods, this is the time that they need love the most, the same proves true with prayer. When you don’t feel like praying, recognize that it’s not from God but from the enemy, or even your flesh. Pray when you can and even more so when you don’t feel like it. When you are under spiritual attack, studying the Word of God can anchor your ship in the harbor of hope. We have a hope that is secure in Christ, and not even Satan himself can separate us from God (Rom 8:38-39), so it’s great to remind him of that. It’s also great to read portions of Scripture which tell us of Satan and his demons eventual future. Revelation 20:10 says, “the devil who had deceived them was thrown into the lake of fire and sulfur where the beast and the false prophet were, and they will be tormented day and night forever and ever.” Surely the Devil knows that, so to remind yourself (and him and his demons) of that. Their coming condemnation is sure; our condemnation has passed. If that doesn’t rile the enemy, I don’t know what will. When believers partake in the Lord’s Supper, or Communion, they are reminded of the supreme price that Jesus Christ paid. He gave His life so that we might have the remission of sins. God’s righteous wrath was placed on Christ rather than those who trust in Him. That gives us peace with God and ends the condemnation (Rom 5:1, 8:1). This reminder is good for our spiritual lives but it’s not a good reminder for the enemy. When you read anything about the blood of the Lamb of God, you know it’s disturbing the demons. They would love to make the believer feel hopelessly condemned, because they are. If they can’t escape hell, then they hope others won’t either, however Communion reminds us of the new and better covenant. One in which Jesus blood and body where given to purchase those who would be brought to repentance and faith (Mark 10:45). I am obviously being facetious by saying you can keep the enemy off your back by living in sin. Of course, that’s not necessarily true. It might seem like the enemy’s got you where he wants you, because the believer who lives in sin has typically lost the joy of their salvation, and they might even have doubts about their security in Christ. When a Christian lives in sin, they can sin, but not really enjoy it. Yes, the passing pleasures of sin are just that; pleasurable, but believers can’t sin and enjoy it like non-believers who have no Holy Spirit living within. The Apostle Paul suggested dis-fellowshipping one man so that the church would not be infected by sin, but also that Satan might buffet him around so that he might repent and turn back to God and confess their sins. The Apostle Paul wrote to tell the Corinthians to “deliver this man to Satan for the destruction of the flesh, so that his spirit may be saved in the day of the Lord” (1st Cor 5:5), so Paul’s motivation is not to punish the man but keep him from destruction “in the day of the Lord.” That’s love…tough love, but its love, nonetheless. Other ways you can keep Satan off your back is to be silent, underground Christians. Sort of like a private eye Christian who nobody knows about, however, the New Testament church knows of no such believer. To deny Jesus by our silence is the same as denying Him before others, so if you deny Jesus by your life, your words, and your deeds, Satan’s not going to mess with you very much. He sees you’re doing more good for his kingdom than harm. He may order an end to the spiritual attacks for this reason, but if you want to keep the enemy off your back, don’t witness, don’t study, don’t pray, live in sin, and keep quiet about Jesus. If, however, you do all these things, you know you’ll be under fire from the enemy, and that’s okay. It’s good to be in the battle. At least you know you’re on the right side. More to read on this topic: Can Satan Read Our Minds and Thoughts? This is the most eye-opening article I have ever read. It makes so much sense to me. Briefly it says don´t study,don´t read,or do the right things in life. Do what Jesus did and be in conflict the rest of your natural life on earth so you will attain His prize in Heaven. Next post: Why Do More Women Attend Church Than Men?